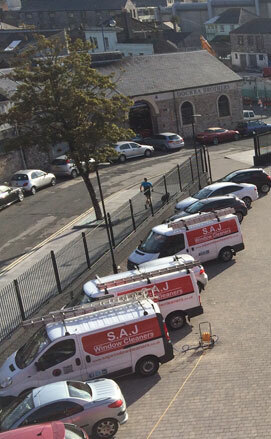 S.A.J Window Cleaners are a family run business specialising in Commercial window cleaning throughout Plymouth, catering to the needs of commercial Window Cleaning, retail window cleaning. 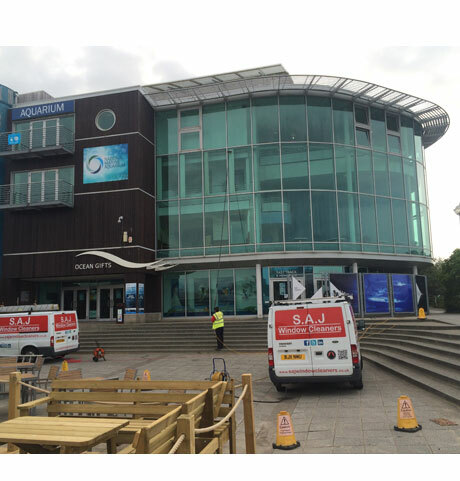 Since S.A.J Window Cleaners commenced window cleaning in 2000, setup by Stuart Castles, we have grown and grown, SAJ Window Cleaners are now one of the fastest growing and most established window cleaning companies in Devon and Cornwall. High and Low Rise S.A.J specialises in cleaning windows of high-rise and low rise buildings and has recognised expertise in the use of Water Fed Poles, Reach & Wash, Extension Pole work and difficult access work. Professional The professionalism delivered by S.A.J has resulted in our client base ranging from high profile retail and commercial clients to small industrial units. Health and Safety First The S.A.J team itself is comprised of highly trained window cleaning specialists, many of whom have been dedicated and loyal to us since 2001. S.A.J's success has been based on the objectives of delivering service and quality beyond the expectations of our clients, by selecting and training the best people in the field and by emphasising efficiency and safety. Quality Cleaning We use a pure water window cleaning system, which leaves windows smear free and sparkling. Competitively priced Not the cheapest, but what we offer is an excellent value for money service, second to none. SAJ Commercial Window Cleaners exceptional service levels have been the foundation to our success and it now means we carry out commercial window cleaning services in every major town and city in the Devon and Cornwall area Plymouth, Exeter, Torquay and Paignton, Bodmin, Truro the South Hams and many more. Our experienced operatives provide a safe, low cost service to shops, offices, hotels, schools, restaurants, dental practices, estate agents, letting agents, nursing homes, car dealerships, stadiums, industrial units, Landlords and many more service providers and commercial property types. Reliable We always turn up on time and are always respectful of our customers property and surroundings. As commercial window cleaners we service all types of premises, from large commercial to small private businesses. Typically these include shops, offices, hotels, schools and nursing homes, although we can also cater to other premises such as solar farms, retail and industrial parks.